Situation: in the district Ronchiano, residential area, hillside location. Estate (shared use): closed plot (fence, electric entrance gate). Plot description: private part of the estate approx. 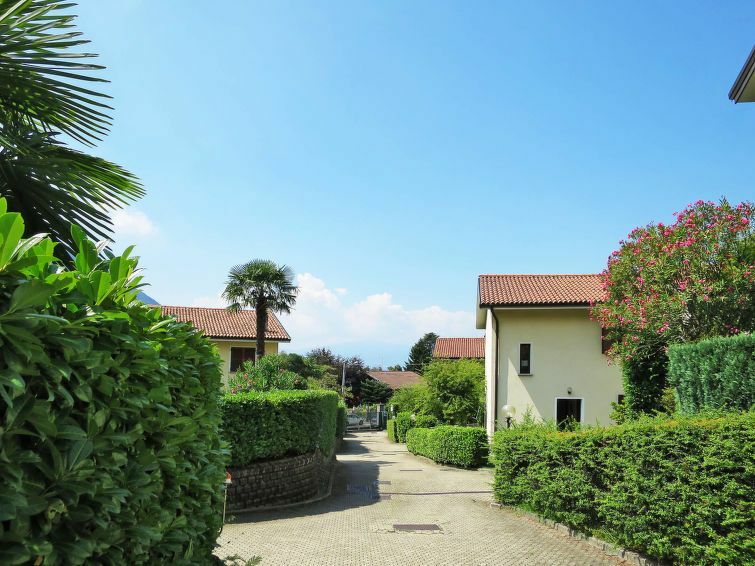 80 m², partially surrounded (hedge), with plants, lawn. 1 x reserved car park in underground garage; parking outside the holiday complex approx. 300 m. balcony (roofed), terrace (partially roofed, sun-blind), furnishing provided (1 garden table, 8 chairs), 2 deck chairs. Center Castelveccana in approx. 500 m. Varese in approx. 30 km. Lugano in approx. 34 km. Train station Porto Valtravaglia in approx. 2 km. Airport Milano/Malpensa in approx. 52 km. Harbour/marina in approx. 1 km (Caldè). Lake in approx. 1 km. Pebble beach in approx. 1.2 km (Caldè). Indoor public swimming pool in approx. 10 km (Luino: Centro Sportivo). Golf course Luvinate: Golf Club Varese (18-hole golf course) in approx. 23 km. end-of-terrace house, 4 - 6 people, 3 room/s, 2 bedroom/s, 2 bathroom/s, approx. 85 m², 2 floor/s. Feature: Property in a residence (28 units in total). Living room/bed room(ground floor): furniture suite, double sofa bed, exit. Kitchen: separate (ground floor). Kitchen/ cooking equipment: 4 gas rings, oven, microwave oven, dish-washer, refrigerator, freezer, coffee machine, water boiler, toaster. Bedroom 2(floor 1): 2 x single bed it is allowed to put together the beds, exit to balcony. Important information: Car park in underground garage: maximum length of 4.30 m, entrance gate 2.15 m wide, access road to underground garage difficult to pass for vehicles with low ground clearance, not possible for lowered vehicles.